The Vera Pizza Napoletana Association and the Neapolitan Pizzaiuoli Association proclaimed January 17th “Giornata del pizzaiuolo napoletano” (Day of the Neapolitan pizzaiolo). The choice of the date is not accidental because on this day we celebrate Sant’Antuono Abate, which is considered the protector of the bakers and the pizzaioli who cooked their pizzas, from ancient Greece, in the dome oven. 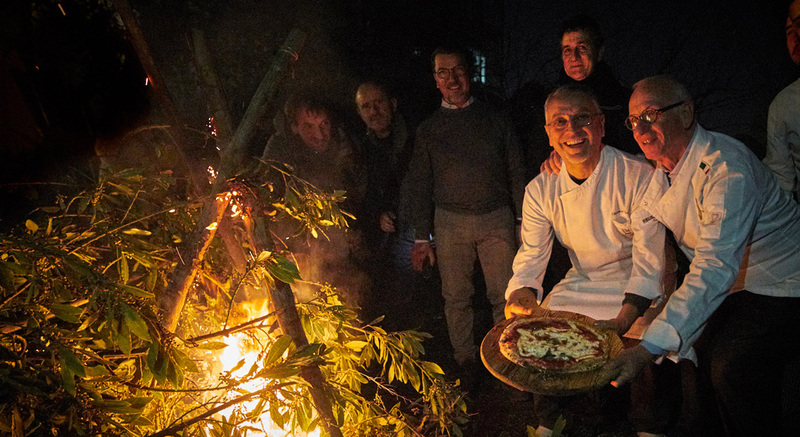 If we go backward for a moment, we will find a fantastic and incredible history of tradition that connects the sacred and the profane, the city of Naples, the pizzaiuolo craft and its charm. Man evolves with the discovery of fire: the ability to cook food identifies Homo Erectus and differentiates it from animals; he lives in community by creating villages with social systems and internal rules. Fire must be considered in many aspects both religious and pagan and popular. Sant’Antuono is the saint of demonic temptations: in fact many depictions portray the saint with demonic presences that conspire against him, while in the background mysterious fires burn. In the city of Naples there is the Church of Sant’Antuono Abate in the homonymous village near Corso Garibaldi. Here, and in other parts of the city, “O cippo ‘and Sant’Antuono” was lit up: during this celebration, the alleys and streets were illuminated by big and small bonfires that, according to the belief, have the power to purify and drive every evil away. Do not confuse Sant’Antuono with Sant’Antonio, mind you, which is celebrated on June 13th instead. This is clearly explained by Salvatore Di Giacomo in his book “Taverne famose napoletane”. In the chapter “La trattoria di Monzù Testa. La taverna delle bizzoche al Purgatorio” he told about a pizzaiuolo, such Don Domenico Testa and his father, Antuono precisely described as: “era un bell’uomo grasso e grosso. Aveva una pizzaria alla salita Santa Teresa, a sinistra di chi va a Capodimonte. La pizzaria era a un tempo anche bottega da maccaronaro: il nonno stava lì dietro il banco ogni sera, con un grande grembiule sulla pancia, e scodellava i due e i tre fino alla mezzanotte. Lui a Santa Teresa e sua moglie al Cavone di S.Gennaro dei Poveri, ov’era un’altra pizzaria con un gran forno” (he was a handsome fat man. He had a pizzaria at salita Santa Teresa, to the left of those who go to Capodimonte. The pizzaria was once a maccaronaro shop also: the grandfather was behind the countertop every night, with a big apron on his stomach, and he cooked two and three until midnight. He was in Santa Teresa and his wife at the Cavone di San Gennaro dei Poveri, where there was another pizzaria with a large oven. In the Neapolitan dialect, there is a famous saying “levaci o’ viecch e puortc o’ nnuov” (out with the old and in with the new). It seems to me that this proverb fits perfectly with the hope of a new life for the Neapolitan pizza and the Neapolitan pizzaiuolo craft which has been recognised as an intangible cultural heritage by UNESCO.